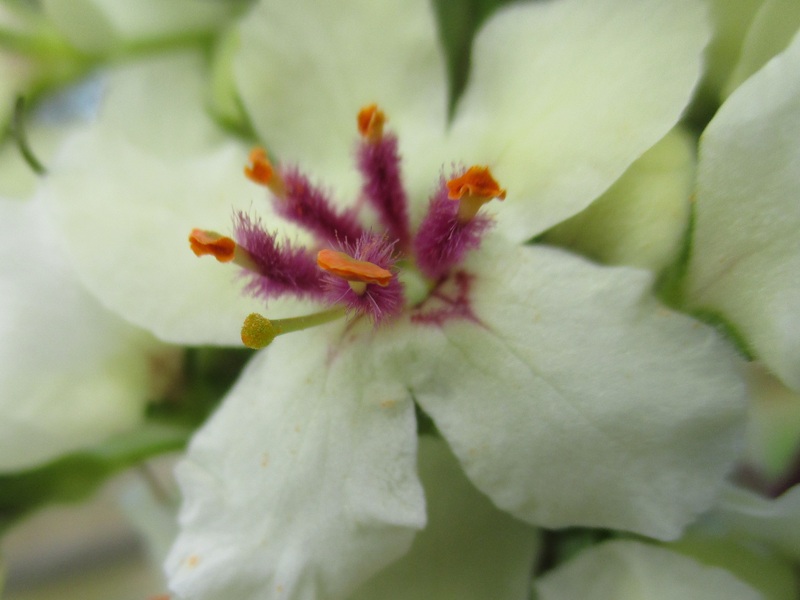 This is just one of the myriad of individual flowers covering the elegant spikes of Verbascum chaxii. Beautiful in entirety, wonderful in isolation. Very pretty! Verbascum bombyciferum is a volunteer in my garden, six feet tall and sprouting up in unexpected places such as the gravel covered parking spot. It’s an odd looking plant, but I’m fond of it. I love them! Do you get the mullein moth caterpillars over there? No, thank heavens; or at least not yet. I’ve got some kind of moth that wants to get into rice, oats, barley, etc. I have to make sure everything is stored in moth-proof packaging. I’ve never had this problem in my cupboards before. Ugh. After my smug comments in September that the Mullein Moths ate my Buddleja – they have subsequently found my Verbascums! I have the white chaxii and a yellow form, or does that go under a different name? They have been, there was obviously not enough to eat on the Buddleja!